Last Saturday, we had the privilege of hosting Awakin Call with Tsering Gellek. Tsering Gellek works to preserve sacred Buddhist art, artifacts and culture throughout Asia in order to promote human dignity, tolerance and global engagement. 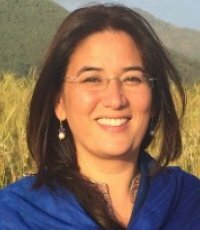 She is director of the Sarnath International Nyingma Institute founded by her father, Tarthang Tulku, a Tibetan Buddhist monk. She is a self-proclaimed bridge builder between cultures and time periods. From her first major projects directing the installation of large peace bells at the most significant Buddhist holy sites throughout India and Nepal, to being the first female director to lead the renovation of Nepal’s oldest monument, the Swayambhu Stupa, to her current role developing programs with universities and centers of learning around the world, and to harness the power of sharing between the East and the West, Tsering investigates how the past can “support the possibility of adapting to the present moment, and more importantly, to a better future." Honestly I think my strongest practice is not holding on to things that have either upset or hurt me. I think it's been a training that I've been exposed to for much of my life. I love humor and joy and friendships and connections and I have been really blessed with beautiful people in life, so my practice is really about being as transparent as I can be. I wear my heart on my sleeve I cry rather openly. I have bounced back and been joyful and open and loving as I can be after getting hurt. When I was assigned the project [to renovate Swayambhu Stupa] I received a letter and blessing from the Lamas. It said, "It [the renovation] will start well, the middle would be difficult, and in the end it will be over." My father gave me the advice, "Have lots of parties." I had lots of tea parties with the priests, getting to know people...Things that could be difficult to resolve could be resolved over sitting down and having a meal together. The hidden meanings of what we do, do get revealed over time. We all share the same moon. How can we be so different and share these common spaces? Feel in your bones and move from there. If you hold onto a rigid self image of perfection you're going to break. I was quite sloppy and messy in some ways but it made me flexible and gave me space to grow and recover. So a combination of forgetting about things that don't go as you expect, starting fresh each day and when you have a hard time being real about it, and sometimes you have to step out and take a break. You're in it for the long run. We have in this last fifty years increasingly become so momentary in our horizons. We've shortened our timeframe. We don't make things that are multi-generational. When you go see Ajanta and Ellora and such places there were people who committed generations to creating things of beauty and spiritual significance. If we can find ways to work on things that go beyond our lifespan that's an incredible gift to the future. Do something that you won't be able to finish in this lifetime.